Ziconic was 4th out of a 6 horse field... he was last most of the way around and passed two tiring horses in the end. Time for him to be retired and gelded, to find a new career like Coz. Is he as difficult to manage as Cozmic One was? He is a lot flashier, and if he is indeed easier to handle, he could be an even better retraining prospect. The Frankel, Frankincense, who finished third, is out of a half sister to Excelebration (IRE), Lancaster Bomber, and Mull of Killough (IRE). The War Front in the race, Combat Zone, was a $450k Keeneland purchase and is a full brother to graded stakes placed Doctor Chit. He finished second to last. Cheery Oats (Distorted Humor/Oatsee) is set to make her debut on Valentine's Day in the 6th at GP. Truly Together finished 3rd beaten by 5 lengths, on February 10, 2018, at TAMPA BAY DOWNS in Race 9. Earned a Graded Stakes placing closing well in the stretch to finish behind Dona Bruja (ARG) and La Coronel (Colonel John) in the LAMBHOLM SOUTH ENDEAVOUR S. (G3T). Ax Man (Misremembered - Shameful, by Flying Chevron) finished 4th beaten by 16 lengths, on February 10, 2018, at SANTA ANITA PARK in Race 6 (San Vicente). Seau (Distorted Humor), a 1/2 to Super Saver, broke his maiden in the 7th at SA. Didn't see whether or not he was claimed. Last edited by katmandu on Sat Feb 10, 2018 7:57 pm, edited 1 time in total. All Out Blitz and Ax Man dueled on the front for much of the race, setting some pretty fast fractions. They both had nothing left in the stretch, finishing way behind Kanthaka. Even 2nd-place Nero ran better than Ax Man. Not sure where Baffert goes with the Misremembered colt after today. Is the race a toss, is he better off sprinting...or will we see a different jockey on him next time? mariasmon wrote: Cheery Oats (Distorted Humor/Oatsee) is set to make her debut on Valentine's Day in the 6th at GP. Well-beaten 7th, but perhaps she would prefer dirt next time. Holland Park (Tapit/Round Pond) broke his maiden today at AQU. I'm a Lucky Guy is entered to run on February 18, 2018, at OAKLAWN PARK. Still reported as a colt, in for the $12,500 tag, was in for $20k last race. This will be his 3rd start, finished 10th (last) and 7th. I guess he couldn't overcome his early birth problems, but I hate to see him drop through the claiming ranks when he shows little talent for racing. Funtastic (More Than Ready), a 1/2 brother to Gun Runner, is in the 11th at GP on Sunday. Sparrow Castle wrote: I'm a Lucky Guy is entered to run on February 18, 2018, at OAKLAWN PARK. Morse Code (Tapit x Serena's Cat) is running in a few minutes in the 8th at Santa Anita, a 7 furlong AOC. The colt went for just $32,000 last fall at Keeneland, but his new connections sound very high on how well the half to Honor Code is training. ETA: Looked like he finished 6th. Had a very wide trip but was just even-paced in the stretch. 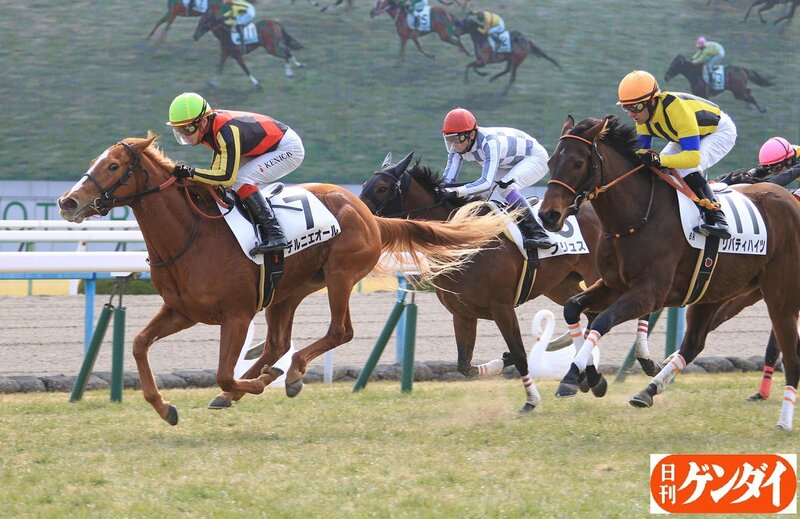 ORFEVRE 's full little sister is... little. 3f DERNIER OR (Stay Gold x Oriental Art (Mejiro McQueen)) ridden by Orfevre's regular jockey Kenichi Ikezoe made it 2 from 3 with a gutsy win. Synchrony is by Tapit and out of the hard-knocking, grade I-placed mare Brownie Points. No takers on the tag, only the winner was claimed. I'm a Lucky Guy finished 4th beaten by 15 lengths, on February 18, 2018, at OAKLAWN PARK in Race 3.